Seats for babies, whether they are for eating in, playing in, or just simply sitting in, are a vital part of the learning and developing process. They are essential buys for every parent with a young child, from the booster seat in the car to the highchair in the kitchen. 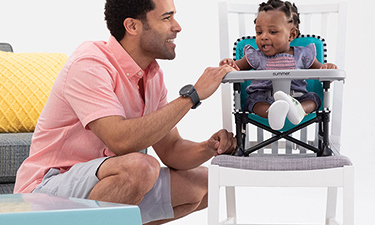 Choose from a variety of brands and products, including booster seats from Munchkin and Babymoov, and high chairs from East Coast and Tiny Tatty Teddy. Baby Brands Direct offers fantastic wholesale prices on all of these items. Our clients are delighted with our stylish solutions that fit any home décor. Discover eye-catching, functional and safe range of bestselling baby seating products. You can now become a retailer of the top rated highchairs and boosters by industry experts, critics and most importantly parents. Versatility in shape, colour scheme and sizes allow every retailer to provide customers with items that fit their clients’ lifestyles and preferences. It is important to understand what makes a good booster, a seat or a high chair. Surely quality and safety play a crucial role. Yet it is all about meeting clients’ needs. Reviews show that parents often jump into buying an item that simply does not fit their indoor spaces. Offering a variety to you means you are offering a variety of choice to your clients. Baby Brands Direct understands that retailers value their clients and strive to assist them in making the right choice when it comes to making the right purchase. Our high-end selection suits even the fussiest styles’ preferences. From boosters and baby seats, to height adjustable and reclining highchairs we also have highchair accessories like cushions and inserts. To make the seating an interactive process, you can also stock from our fantastic ideas of trendy high chair toys.